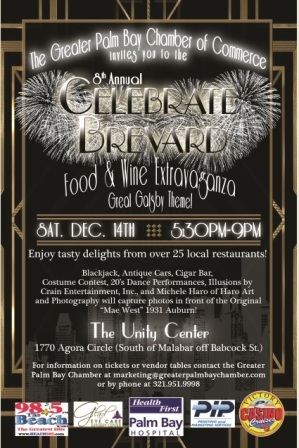 We are currently seeking food and non-food vendors for the 8th Annual Celebrate Brevard- Food and Wine Extravaganza! FOOD VENDOR TABLES ARE FREE! In Randy’s vast experience, he has performed in living rooms, fields, back yards, restaurants, garages, limousines, banquet halls, hotel ballrooms, and stages of every shape and size. Some of his clients include The Ritz Carlton, Americas Got Talent, and IBM. His unique ability to adapt his show to any audience from small children to corporate executives puts his performance on the cutting edge. Professional photographer Michele Haro of Haro Art and Photography will capture photos of guests in front of the Original “Mae West” 1931 Auburn, once owned by Hollywood legend Mae West! Contact the Greater Palm Bay Chamber for more information regarding the event and/or vendor space availability at 321-951-9998 or by email at marketing@greaterpalmbaychamber.com.